Mmmmmm this salad is amazing. It’s more work than the average salad because there’s a ton of chopping, but the combination of flavors definitely worthy of the title. It makes you feel like you’re at an island party. I first had this salad at Cheesecake Factory with my mom and sister. My mom and I had given Lori the job of picking out a salad for us to share before the main course and I’ll be honest, when she told us which one she had decided to go with I was less than enthusiastic. I didn’t understand how one would come up with putting mangos and green beans on the same plate much less mixed with lettuce and carrots. When the salad came out though and we tried it, we all absolutely LOVED it. Now whenever I head to the Cheesecake Factory the only problem I have is an internal debate of whether to get an entree or just enjoy a giant salad all to myself. What’s funny is that even though Lori was the first one to get me hooked on this salad, I made it for her once in Salt Lake as a surprise when she came up to visit. She was looking at the ingredients skeptically and I couldn’t figure out why she was looking doubtful. As soon as she tried it she said, “This is really good. Man I was worried there for a minute when I saw the green beans and the mango.” I laughed. 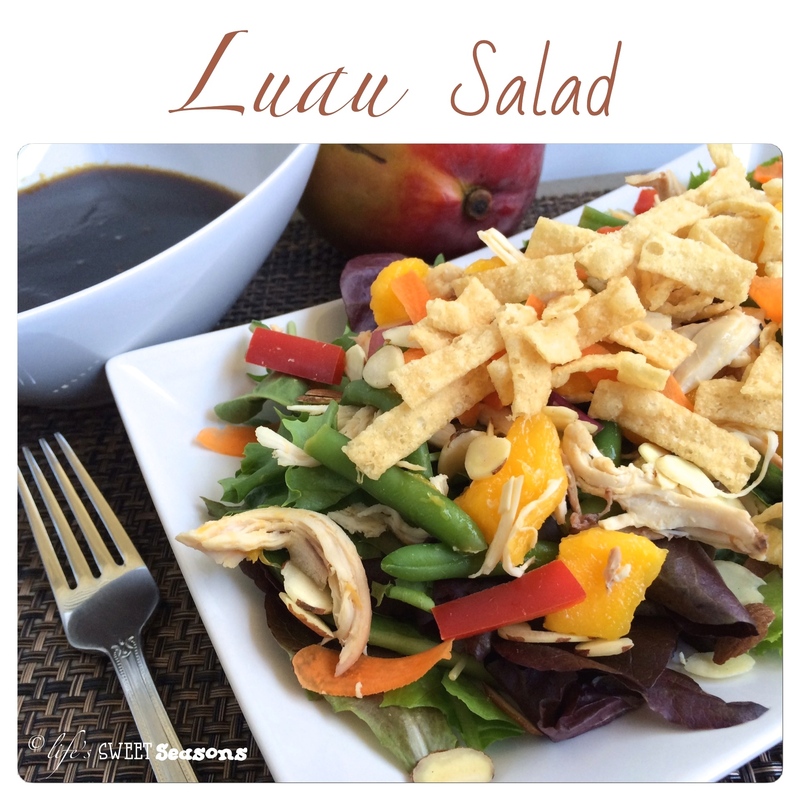 I started making this salad as soon as I could find a decent copycat recipe of the salad dressing. This dressing has an asian hint to it, but it’s sweeter than most salad dressings. 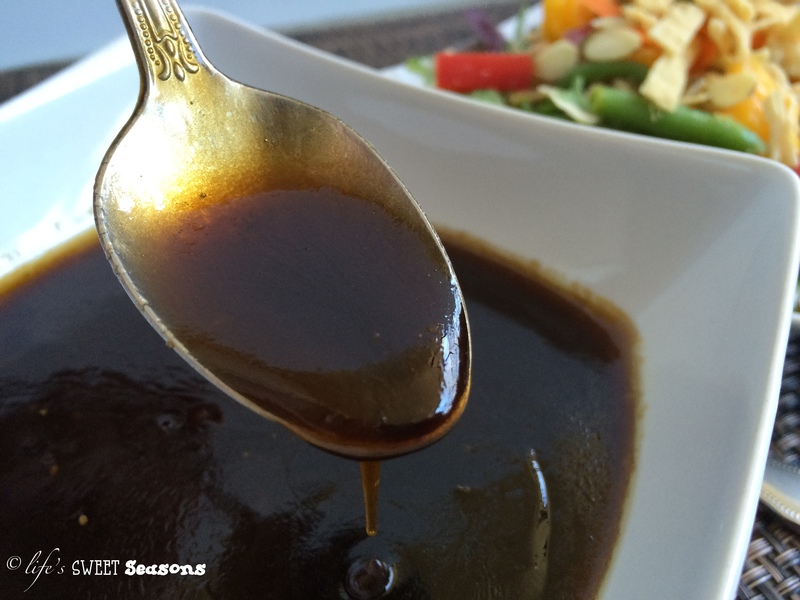 I prefer to use a bottle of Trader Joe’s balsamic vinaigrette for the base, but if you can’t find that then I’ve listed an alternative. The alternative does turn out kinda thick, but still delicious. You don’t need a ton of dressing though, a little goes a long way. Don’t skip the garnishes, especially the wonton strips. They help make this salad unique. Man, I love luaus. And beaches. And barbecues. Is summer here yet? 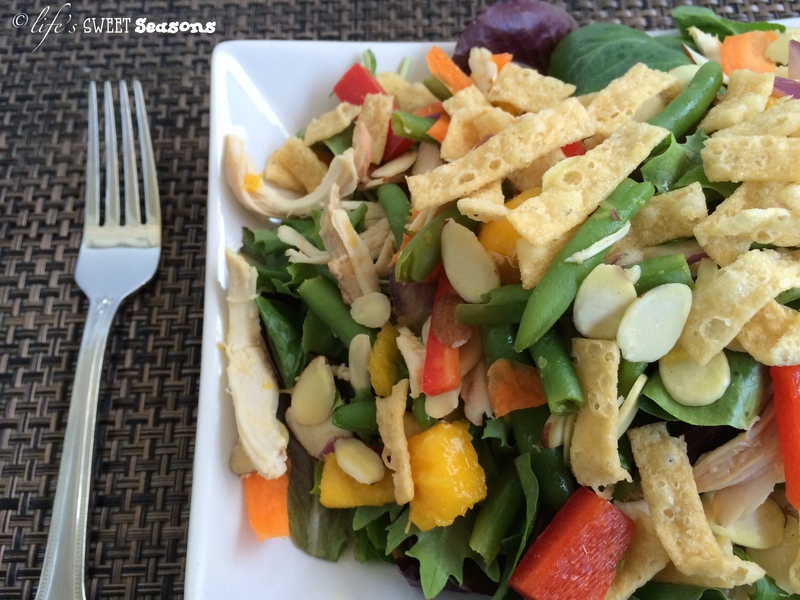 Place the chicken, bell peppers, green beans, red onion and mango into a large mixing bowl and set in the fridge. You can make this a day in advance. 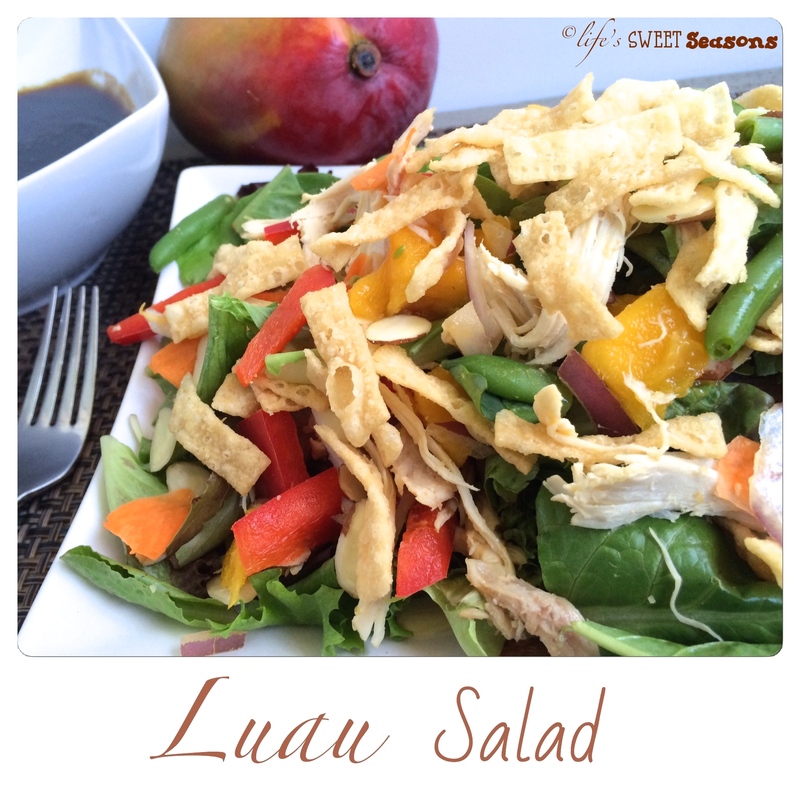 Make Luau Salad Dressing by combining all the ingredients and whisking away or putting them all in an airtight container and shaking like crazy. Place lettuce mix on serving dish and add chicken-mango mixture. Top with green onions, your choice of nuts and wonton strips.